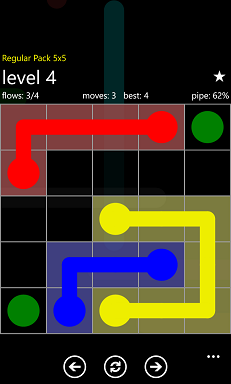 Flow Free game is a puzzle game where players try to connect two matching colors on a grid board with pipes. 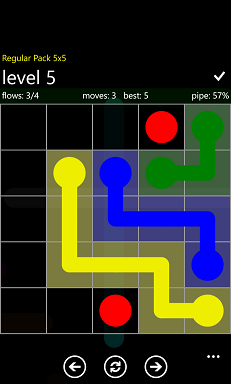 While trying to connect matching colors by touch on the grid game layout, take care not to cross previously drawn connecting pipes or lines. The aim is to connect all colored squares with matching color without a overlap on the board. 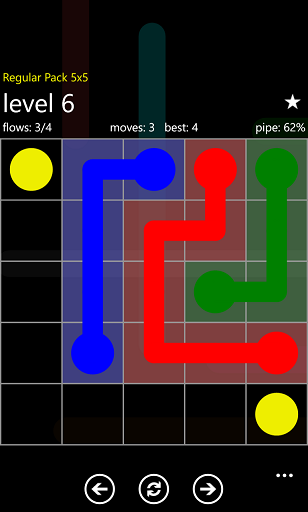 Flow Free puzzle game can be considered easy to solve. But if you let your kids play this educational game, they will have to build their own solutions by thinking about all colors and available empty squares on the board. I believe playing Flow Free game is a real challenge for most kids. They will love to play Flow Free with its live colors and fun sounds. Especially with each Flow Free solution, and advancing to next step they will be more eager to search for new solutions to new puzzles. You can play Free Flow by solving hundreds of game levels each containing a new puzzle game. Or you can try yourself to solve the puzzle in the shortest time in Time Trial game mode against timer. You can find more information on Windows Store about Flow Free game for Windows 8 and for Windows Phone 8 devices.